This article is about the occupation of Germany. For the zone in Austria, see Allied-occupied Austria. Soviet Occupation zone in red. The Soviet Occupation Zone (German: Sowjetische Besatzungszone (SBZ) or Ostzone; Russian: Советская оккупационная зона Германии, Sovetskaya okkupatsionnaya zona Germanii, "Soviet Occupation Zone of Germany") was the area of central Germany occupied by the Soviet Union from 1945 on, at the end of World War II. On 7 October 1949 the German Democratic Republic (GDR), which became commonly referred to as East Germany, was established in the Soviet Occupation Zone. 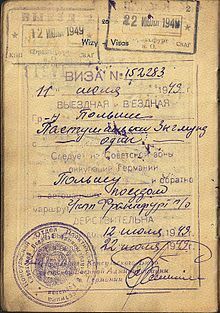 1949 Soviet visa from occupied Germany in a Polish service-passport. The SBZ was one of the four Allied occupation zones of Germany created at the end of World War II. According to the Potsdam Agreement, the Soviet Military Administration in Germany (German initials: SMAD) was assigned responsibility for the (present-day) eastern portion of Germany. By the time forces of the United States and Britain began to meet Soviet forces, forming a Line of contact, significant areas of what would become the Soviet zone of Germany were outside Soviet control. After several months of occupation these gains by the British and Americans were ceded to the Soviets, by July 1945, according to the previously agreed upon occupation zone boundaries. The SMAD allowed four political parties to develop, though they were all required to work together under an alliance known as the "Democratic Bloc" (later the National Front). In April 1946, the Social Democratic Party of Germany (SPD) and the Communist Party of Germany (KPD) merged to form the Socialist Unity Party (which later became the governing party of East Germany). The SMAD set up ten "special camps" for the detention of Germans, making use of some former Nazi concentration camps. In 1945, the Soviet occupation zone consisted primarily of the central portions of Prussia. After Prussia was dissolved by the Allied powers in 1947, the area was divided between the German states (Länder) of Brandenburg, Mecklenburg, Saxony, Saxony-Anhalt and Thuringia. On 7 October 1949, the Soviet zone became the German Democratic Republic, usually referred to in English as East Germany. In 1952, the Länder were dissolved and realigned into 14 districts (Bezirke), plus the district of East Berlin. In 1952, with the Cold War political confrontation well underway, Joseph Stalin sounded out the Western Powers about the prospect of a united Germany which would be non-aligned (the "Stalin Note"). The West's disinterest in this proposal helped to cement the Soviet Zone's identity as the GDR for the next four decades. "Soviet zone" and derivatives (or also, "the so-called GDR") remained official and common names for East Germany in West Germany, which refused to acknowledge the existence of a state in East Germany until 1972, when the government of Willy Brandt extended a qualified recognition under its Ostpolitik initiative.